Born and educated in Christchurch, Darren Kerei-Keepa (Ngāti Kurī, Ngāti Paaka, Ngāti Mamoe) has strong ties to the small coastal settlement of Oaro, south of Kaikōura, where he has whānau land and spent a lot of time while growing up. Darran spent 13 years on the board of Oaro M Incorporated which oversees the land. Darran has represented Te Rūnanga o Kaikōura in the local community as a Tangata Tiaki and as chair and committee member of the Creative Communities funding scheme. 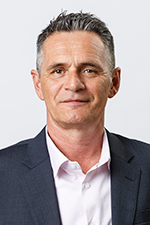 He has been a member of the Executive of Te Rūnanga o Kaikōura on two previous occasions and was the primary cultural monitor for the rūnanga. He lived in Kaikōura for 15 years and spent 14 years as the chair of Ngā Uri o Mangamaunu Marae, standing down in 2015. Darran has had a long career in the building industry as a self-employed painter and decorator. He currently lives in the Nelson region with his partner Karen, who is of German decent. He has three children – daughters Bria and Mahalla, and son Ranui.